Amateur Criteria for A.K.A. bouts. Free - Video of A.K.A. bouts. Instructors - Level / Dan Grades. Are you a K-1, ( Oriental Style Rules ), Amateur Kickboxer? If so, then A.K.A. Kickboxing events could be ideal for you! A.K.A. Grandprix Tournament bouts are 3 rounds in duration, in the event of a draw, an extra round is required. Bouts are contested using the O.S.R. ( Oriental Style Rules ) Kickboxing format, ( also known as K-1 Rules ), under A.K.A. regulations and scoring criteria. Full-Contact Karate styles, such as SeidoKaiKan and Kyokushin. The titles for championships are co-sanctioned through the I.K.F. with Bronze, Silver and Gold medals. Division winner also have the option of an official title belt. All are welcome to enter the A.K.A. 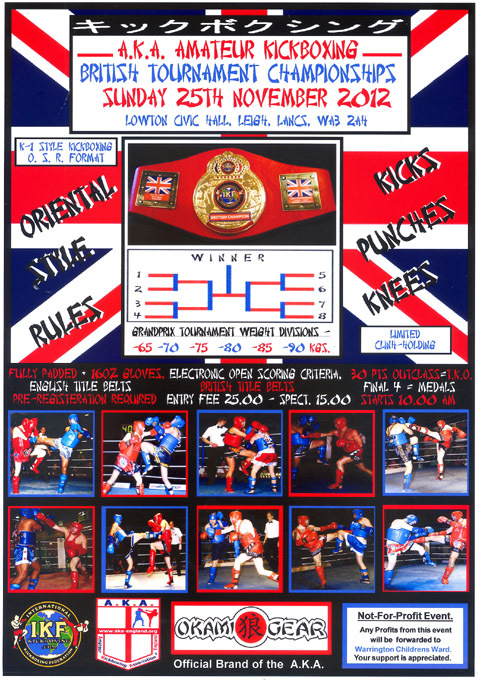 Kickboxing Championships and test themselves under Amateur K-1 / 'Oriental Style Rules'. 2011 A.K.A. Championships - Results & Photos - CLICK HERE! © Copyright 2002. AKA England. All Rights Reserved.